The Glee gang is all here. They've gathered on stage to sing the classic single "One of Us." The group sang together at the conclusion of "Grilled Cheesus," despite sharing different religion beliefs. This is a shot of them covering "One of Us." We can't get enough of Sue Sylvester in our lives. This is a shot of the character from the episode "Grilled Cheesus." Sue corners Kurt in this photo. It's taken from the third episode of season two of Glee. Finn prays to a sandwich in this scene from Glee. It's courtesy of the episode "Grilled Cheesus." 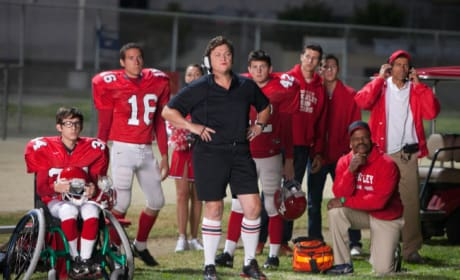 Coach Beiste has been a welcome addition to Glee. She's a different kind of character than anyone else on the series.